One of the best examples of 60’s brutalist monolith structures is a sizeable and well considered building designed for a dramatic site in cold climate. Since a significant slice was built as the first phase by a confident and dedicated architect, the functionality of the building can be assessed to measure various design criteria envisaged by John Andrews. 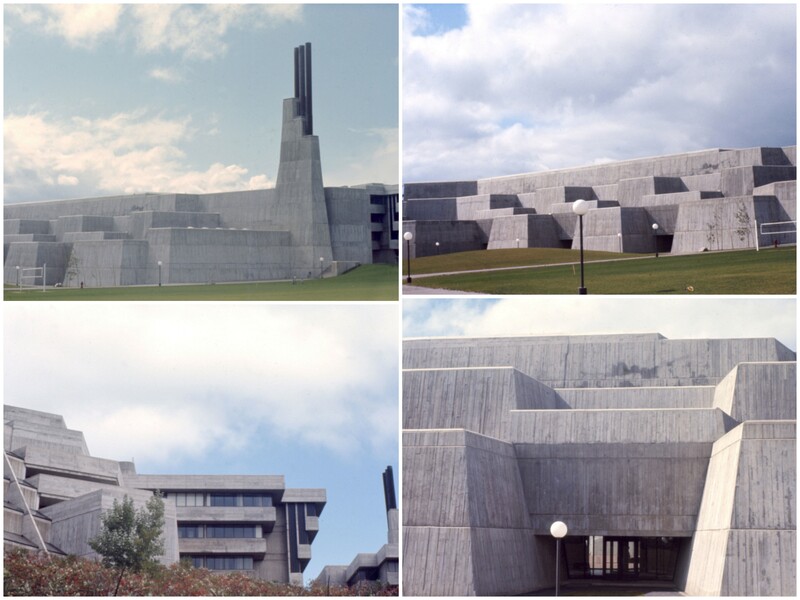 Unfortunately, the Canadians seem to be shy or ashamed of this significant building and the younger generations of architects seem to be unaware of this example of romantic brutalism, representing a significant branch of modern movement in mid 20th century. 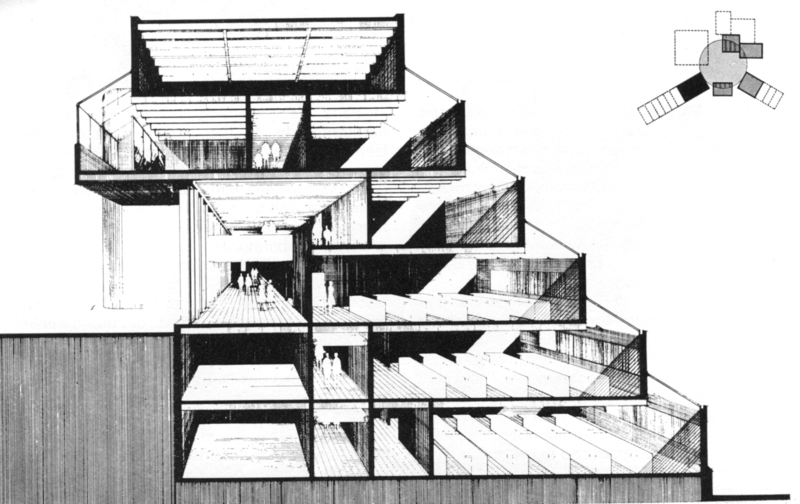 Kenneth Frampton wrote a critique of this building in April 1967 issue of Architectural Design. I am reproducing some of the drawings from this article and paraphrasing or quoting some other relevant parts. Scarborough was designed as one of the first two satellite campuses to take all their undergraduate programmes. As it was a fair distance away from Toronto, the students were to gain access by car or bus. 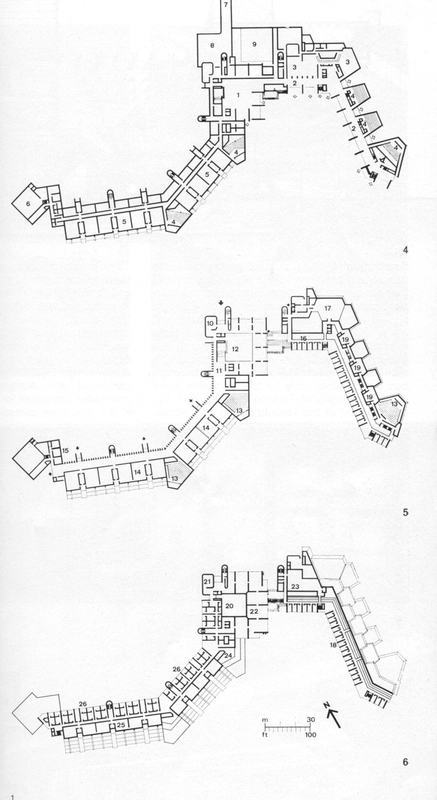 Kenneth Frampton was surprised to see lack of undercover walks from distant car parking to a building which entirely relied on warm covered student circulation. He assumed that this was either a cost saving measure or possibly certain architectural preconceptions about approach and entry to the building. 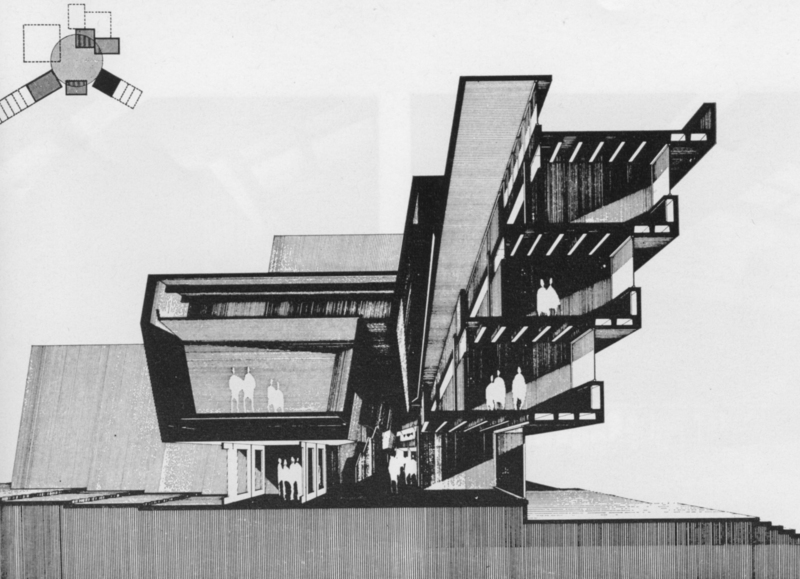 Andrews wanted the open academic near the admin block to be a dignified, formal hub of the college activity giving access to all college buildings. The layout is centralized in its organization. The positioning of radiating wings of the building was governed by the site constraints and maximum walking distance of 10 minutes. 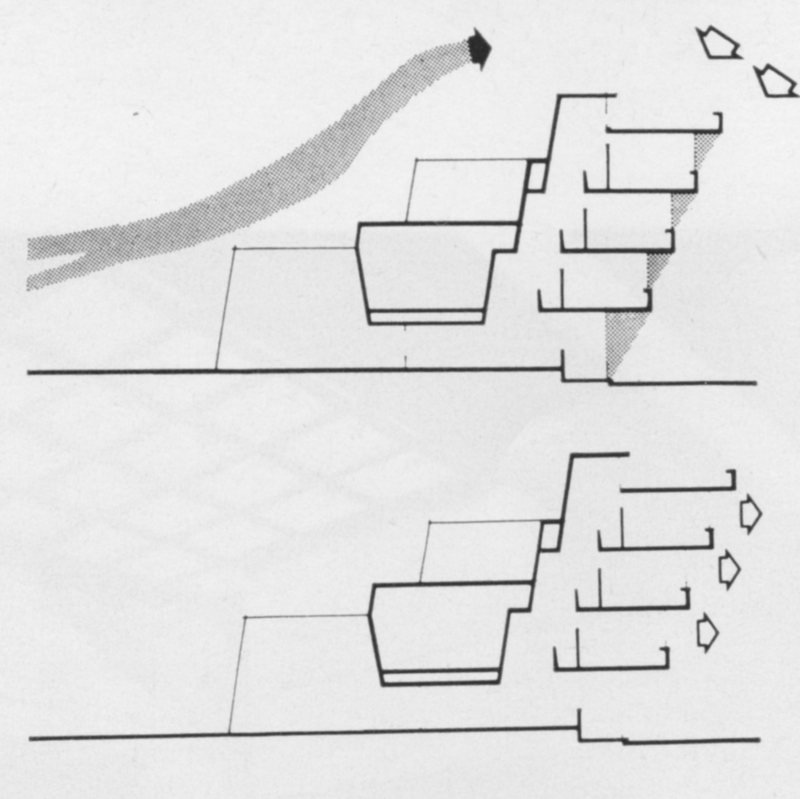 KF considers the building to be a biological organization on an irregular site, difficult to handle formally. Receding or cantilevered wings modulated, when possible, by structural or servicing elements as well as cranked ‘knuckles’ containing lecture halls, changing the direction of wing segments. The entire building is thus ‘coded’ externally to express consistently four different component functions: lecture halls, offices, laboratories and staircases. The projecting or receding elements also help to form continuous enclosed pedestrian streets rising two floors or full height of the building. The inclined service ducts serving laboratories not only feed and drain waste from the laboratories but also distribute forced air to and from ducts on the roof. In the humanities wing a two-tiered counterpointed battery of lecture halls maintains a protective windowless wall on northern windswept face, while the faculty offices on south face project out providing solar protection. 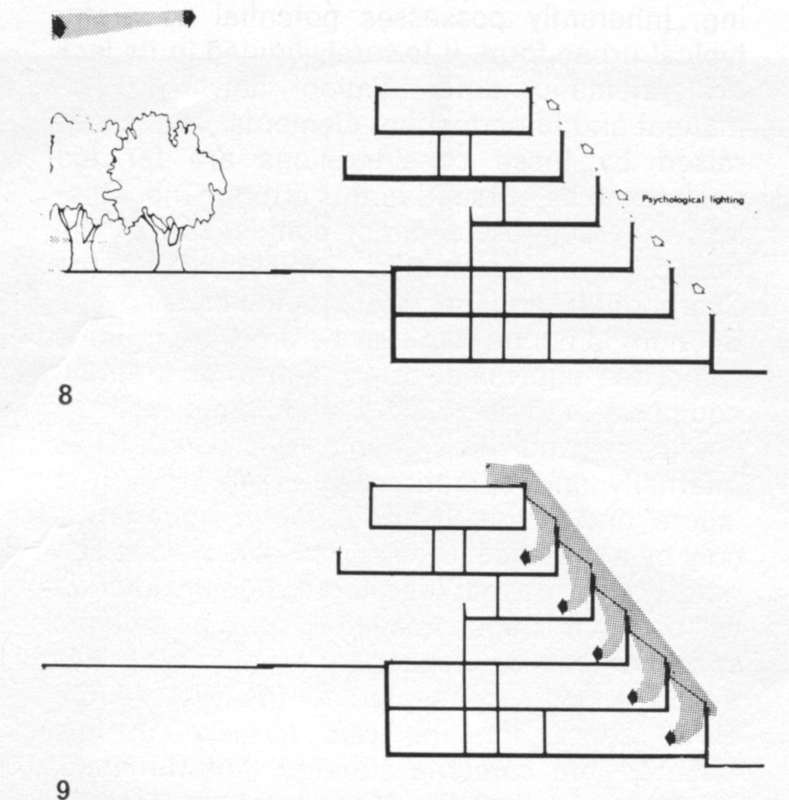 Tiered sections also provide daylight to internal streets and full height court, ‘meeting place’ placed at the meeting of two converging streets. Scarborough possesses a built-in allowance for variable patterns of use….. Towards the end KF writes in some detail about the intellectual aspects of campuses as prototypical city form and compares Scarborough with work of Candilis, Josic and Woods. He considers limits of growth, organization and classic vs. romantic thoughts. I suggest you read the article to read this analysis. After 40 years of expansion and changes, the latest master plan can be seen here http://www.daniels.utoronto.ca/node/753. 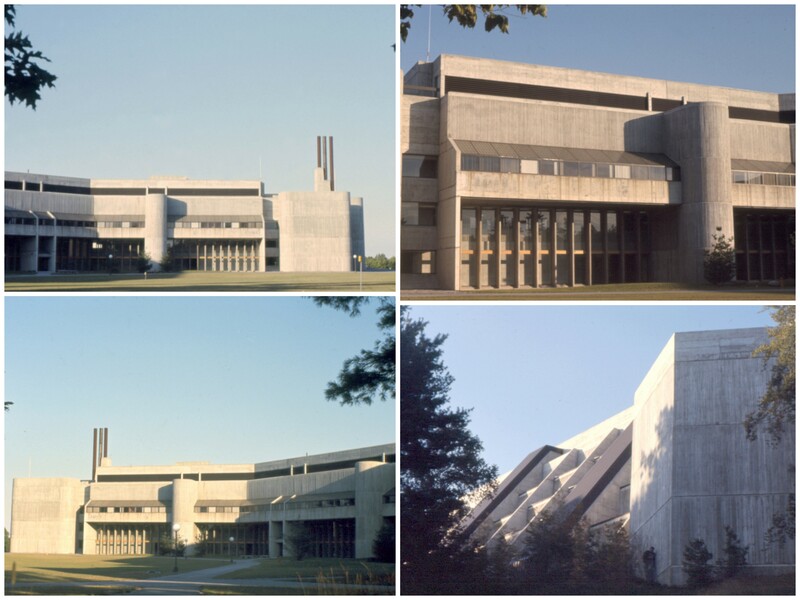 When John Andrews was designing and building this in Canada Denys Lasdun was in the middle of constructing University of East Anglia which has many similarities with Scarborough. 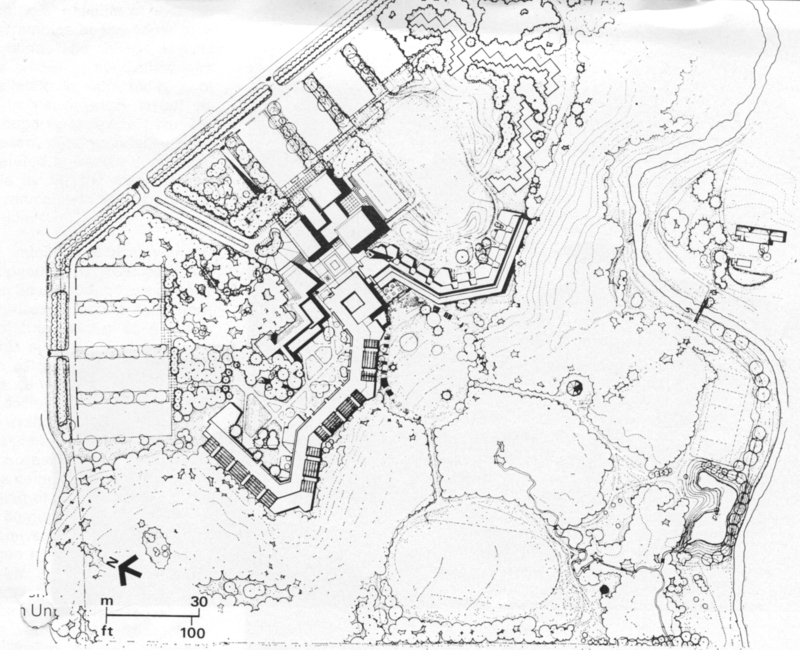 While Patrick Hodgkinson conceived Brunswick Centre in London almost at the same time as Scarborough was being designed, although it was not completed till 1973. It has a much more urban and slightly formal context as one of the best megastructures of the period in this country. I had fun reading this post. I want to read more on this subject.. Thank you for sharing this nice article.. Anyway, I�m going to subscribe to your rss and I hope you post again soon. Thanks. Nice to know that you enjoyed it. hey First Sorry if I used an arabic name Because it is already used from the first time in all English and non English sites and Comfortabl y, the article is actually the sweetest on this deserving topic. I concur with your conclusions and will thirstily look forward to your next updates. Saying thanks will not just be adequate, for the wonderful lucidity in your writing. I will immediately grab your rss feed to stay privy of any updates. Solid work and much success in your business efforts! Thanks for your comments. I am so glad you like it. I do not mind you using some photos and descriptions provided these are properly attributed to my Blog. I do not mind some use for educational purposes but would not allow any commercial use. If you use any parts, please let me know and send me a link . Thanks. Thanks. I am afraid I do not know anything about Yahoo News or its contents. « Birth and death of Newport High School 1972-2008.